In EIA’s latest Short-Term Energy Outlook (STEO), total U.S. crude oil production is forecast to average 9.3 million barrels per day (b/d) in 2017, up 0.5 million b/d from 2016. In 2018, EIA expects crude oil production to reach an average of 9.9 million b/d, which would surpass the previous record of 9.6 million b/d set in 1970. 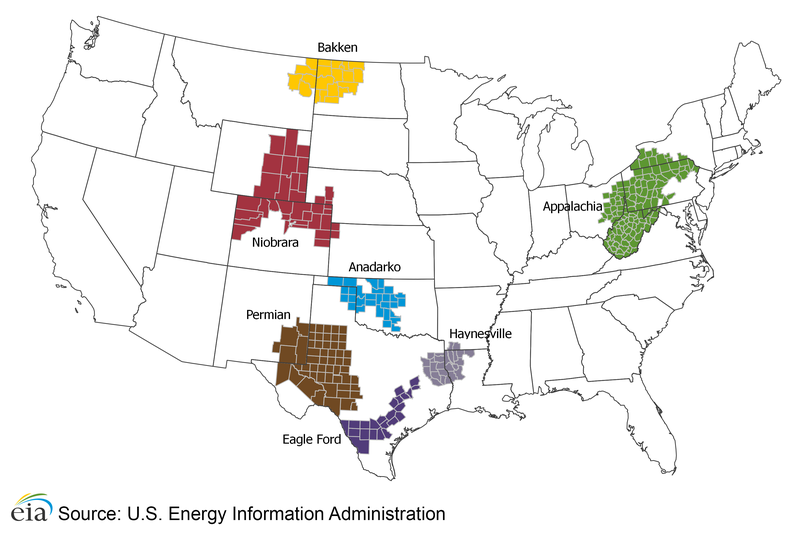 EIA forecasts that most of the growth in U.S. crude oil production through the end of 2018 will come from tight rock formations within the Permian region in Texas and from the Federal Gulf of Mexico. 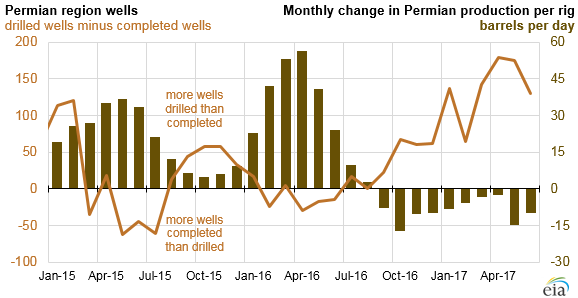 Average output per well shows that productivity based on initial production rates continues to increase in the Permian region. 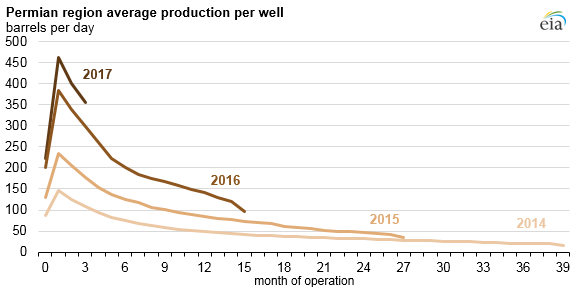 Initial production based on average output per well year to date is higher than the 2016 annual average. Many operators are continuing to experiment with completion techniques to maximize output per well, suggesting the 2017 annual average initial production rate could continue to increase. Note: 2017 is based on year-to-date data (through April). Other years represent annual averages. The dynamics related to drilling in the Federal Gulf of Mexico (GOM) differ from those in Lower 48 onshore regions. Because of the length of time needed to complete large offshore projects, oil production in the GOM is less sensitive to short-term oil price movements than Lower 48 onshore production. In 2016, eight projects came online in the GOM, contributing to production growth. Another seven projects are anticipated to come online by the end of 2018. Based on anticipated production at both new and existing fields, crude oil production in the GOM is expected to increase to an average of 1.7 million b/d in 2017 and 1.9 million b/d in 2018.